I have stealed myself to only eat the Dukan list of 100 foods till I reach my goal weight. So it surprised me when we were out shopping recently and I saw all the Christmas foods on display, that I felt a strong longing for them. Generally I find it is easier to make a choice once and not debate it every day. Dukan Diet also gives me the assurance that after I lose the weight there is a plan there for me to keep off the weight. So I thought I had it all sewn away. Yes I love fruit and bready goodness, but I will beable to eat them again there is just this period to lose weight that I won’t have them. Other diets which just are mant to help you lose weight have no such assurance on the long time plan so when you have to give up a food for that you know that when you put the weight back on you will have to give it up again and that is a little disheartning. I replied that for most things I am fine, but Christmas food is obviously something you only see once a year and I had it tagged in my brain as edible still. To get me over this I invented what I call Pepperkake Dukan Pancakes. They have all the spices I associate with Christmas and I do not feel so deprived. I have also told myself that next Christmas I can eat all I want if I only stick to the plan now. So now I can go back into the grocery stores and see the Christmas foods and not feel a need to grab them up, take them home and eat them. Reminicent of gingerbread and christmas spice cookies these mini pancakes hit the spot. Dukan pancakes just turned festive. Heat a nonstick heavy bottomed fry pan over a medium heat. Add in wet ingredients, and mix into a smooth batter. Drop spoonfuls of batter well spaced into the frying pan. Turn when the batter starts to form bubbles on the top. Serve with sweetened quark, yogurt or plain. Change spices to suit your taste or occasion. 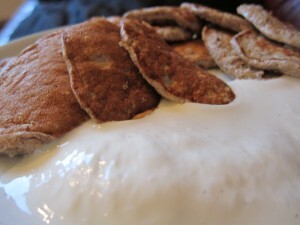 Want more pancake recipes, see my post on Turmeric Dukan Pancakes, for a savoury twist.